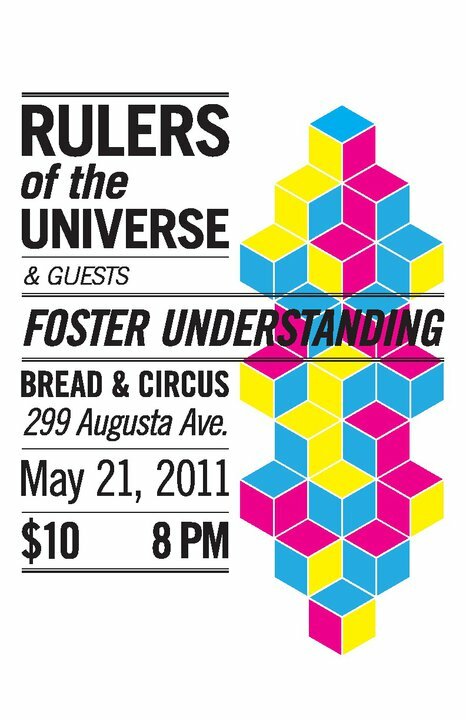 Rulers of the Universe Show! Debs: Errol and I were supposed to write this blog together but he went to sleep after saying “Debs, we have to write the blog”. Thanks, Errol, thanks. So I’m publishing it before he can look at it and correct my “two spaces after a period” thing – haHA! Yesterday we had a show at Bread & Circus in Kensington Market, which is my favourite place in the city! We were invited to come out by the lovely Kat Letwin, who acted in Double or Nothing (aka the steampunk play) in the Simian Showcase. She’s hilarious and sparkly and I was immediately drawn to her when I first met her in April, so it was great to see her again! First though, Errol and I went out for Phở, which I had never heard of before. Phở is a Vietnamese noodle soup served with whatever flavour of awesome you like (Errol’s had beef and mine had tofu). I discovered that Errol drinks green tea cold, the weirdo. The idea of having tea cold is just alien to me – and before you ask, I’ve never tried iced tea, but that would still be weird! We drove over to Kensington Market and manouvered ourselves and our instruments through the very packed pedestrian street and joined the people waiting outside the venue. Who were they? Why, Rulers of the Universe members, of course! We introduced ourselves and hung out in the sunshine until a staff person arrived to let us in. We couldn’t start the show until David, the tech person, arrived but it was definitely worth the wait! Chris Robinson was a fantastic host and had the crowd laughing very, very quickly. He was followed by the very funny Kathleen Phillips and then it was our turn. We found the crowd a little tough because it was more eclectic than it’s been at some of the other shows (in other words, not quite as geeky overall), but the set went really well and the audience did catch a lot of the jokes. I’m pretty sure that someone in the back was a big Battlestar Galactica fan too – they were laughing at all the suave references in our new BSG song that Errol doesn’t get because he hasn’t finished watching the series. We played 6 songs, and then played “Still Alive” on the house piano during the intermission – hooray for requests! We need to learn some more Coulton songs. After the intermission the Rulers of the Universe took the stage. Oh my gosh – their sketches were brilliant and I was laughing so hard. Errol doesn’t laugh during shows; he just smiles. He has really white teeth though, maybe the actors could see them from the stage? We love that we get to see all these amazing comedy acts! Errol will probably be distressed if I don’t talk about the muffins. There were muffins – two huge baskets of them. Not even the fake plastic on-stage kind, but real, delicious muffins that doubled as a prop and a post-show snack 😀 Thank goodness none of us were raptured; we would have missed the deliciousness! As always, thank you so much to our friends and family for coming out to support us – you are wonderful! And tons of thanks to the Rulers of the Universe for bringing us on board! Seriously, “steampunk” isn’t a recognized word? Errol: Never tried iced tea and she calls ME a weirdo?? Errol: Press random button. Nope. Press another random button. Nope. Errol: Good grief! Your song references everything in SEASON ONE! I saw that much! 6 Responses to Rulers of the Universe Show! You know, I usually enjoy Errol’s songs more because I can read the lyrics. Sometimes you sing something so fast that I miss it. Maybe you could distribute/display the lyrics? Would that make it funnier or would it take away the mystery of it all? True. That’s why we like to pull volunteers to show visual aids, like in “One Day We’ll Meet For Real”. 😀 Hopefully, we can figure something out! Aww, you guys! It really was such a pleasure to have you out to the Bread & Circus with us this past Saturday – you’re both so brilliantly talented and genuinely lovely human beings, how could the crowd not love you? How could we not love you? We couldn’t not love you, is what I’m saying. Yeah, that’s right: I’m using double negatives to be super positive. I’m dangerous like that. Once again, thank you so much for performing your awesome ‘choons, and thanks for the kind words about our troupe! I’ll send the rest of ’em over here to take a gander at your blog. No doubt they will all say, “Aww, you guys!” the way that I did.